Home » Past Screenings » Enter to Win BEIRUT ROE Passes! Enter to Win BEIRUT ROE Passes! Enter to win Run of Engagement Passes to see BEIRUT, starring Jon Hamm, in Select Cities! Caught in the crossfires of civil war, CIA operatives must send a former U.S. diplomat to Beirut to negotiate for the life of a friend he left behind. 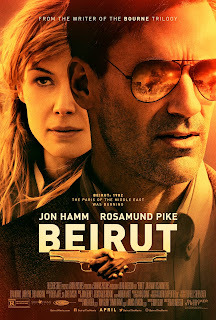 Beirut stars Jon Hamm (“Mad Men,” Baby Driver), Rosamund Pike (Gone Girl, Hostiles) and Dean Norris (“Breaking Bad,” “Under the Dome”). BEIRUT is in theaters on April 11th, 2018. NO PURCHASE NECESSARY. Run of Engagement pass is good for 2, valid M-TH during the engagement for any TBD theater playing the film in the area above. Refer to screening pass for further restrictions.